We’re about to launch the next big thing in personal development for entrepreneurs and salesmen. Do you want to be the first one in your company, to try it? Please check your email to confirm your sign up! What makes a company one of the biggest MLM companies in 2019? We looked at revenues, the number of consultants/distributors, customer base, and brand buzz to put together this list. The main deciding factor we use is the previous year’s total revenue in US Dollars($). If there is a tie in revenue,we then use the other factors as deciding. Some of the companies have been around for decades while others are pretty new to the game. At the time of release for this article, not all companies in this list have released their 2017 earnings, therefore we’ve used the 2016 earnings that are available. For a few of the companies who have gone public with their 2017 stats, we’ve included that in their descriptions. When all companies have released their earnings we will uppdate this list. A word of advice before we move on though: Just because these are the largest doesn’t mean that they are the best mlm companies to join. Joining one of the biggest companies have both pros and cons, here are a couple you should consider. A lot of people have heard of the company so there are marketing opportunities galore. Your local market may be saturated by too many consultants, which leaves no real room for you to grow. Neither in sales or recruiting. A lot of people may have already tried the product and are therefore not interesting in buying. It’s important to consider these factors and others when joining a company so that you don’t just jump into it because of hype. It can be difficult to find the right company for you, who knows, maybe the biggest ones aren’t for you but a new mlm company is a great fit. You never now before you look into them. Compared to the other companies on this list, Team Beachbody doesn’t have the most impressive revenue. It brought in $863 million in 2016, which is nothing to sneeze at but also isn’t more than a billion. Still, the company makes the list because of its brand recognition and ongoing popularity. It saw revenue growth of 10 percent between 2015 and 2016, according to Business for Home. It also has more than 23 million customers and nearly half a million consultants. Rodan + Fields was named the number one skincare brand in the US in 2017. The company also recently cracked $1 billion in revenue in 2016, a significant increase compared to the $629.9 million in revenue it had in 2015. Rodan + Fields wasn’t always a network marketing company. It began life as a brand that was sold in high-end department stores. But it switched to an MLM model in 2008. According to Forbes,the company started with 1,350 consultants. By 2016, it had 150,000. While not the biggest, this company actually made the number one position on our list of the fastest growing network marketing companies. 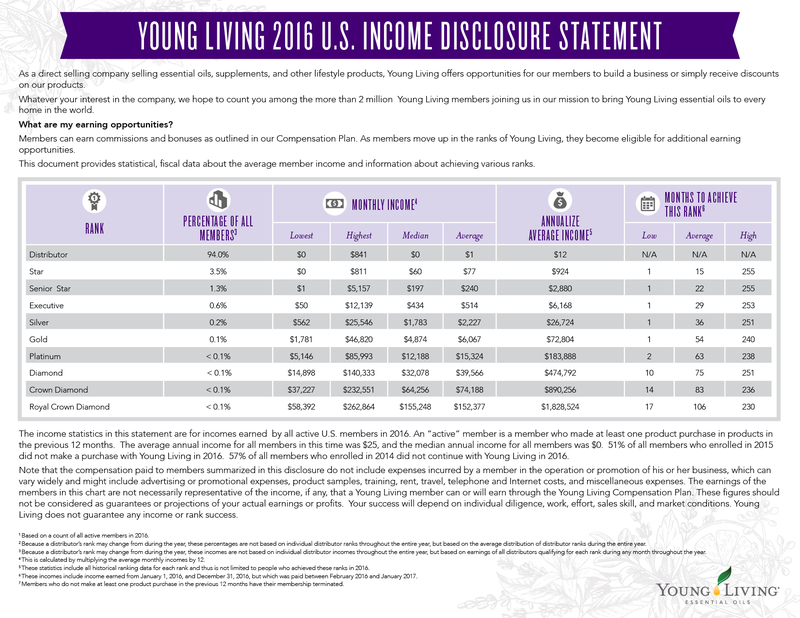 The other top essential oil network marketing company is Young Living, which had $1 billion in revenue in 2016. The company made it to Inc.’s 5000 list in 2011. As of 2016, the company had about 2 million distributors. The lowest tier distributors earned an average of $12 while the top tier averaged more than $1.8 million. USANA had 2016 revenues of $1.01 billion, putting it in position 20 on the Global 100. The company operates in more than a dozen countries, including the US, UK, New Zealand, Japan, and Belgium. The company divides its distributors into three categories: customers, earners and business builders. In 2014, it had more than 61,000 total distributors in the US. About 18 percent of distributors had made it to the business builder category while the majority were customers. The UK’s Telecom Plus had revenues of $1.12 billion in 2016 (744.7 million GBP). Like Ambit Energy, it uses an MLM model to sell electricity and gas service. It also offers broadband and mobile services. Although the company’s revenue has steadily increased each year since 2011, in 2016 it did dip slightly, due to a bump in energy prices. Telecom Plus has 600,00 members and provides services to 2.3 million, an increase of nearly 5 percent. Ambit Energy is a gas and electricity supplier that happens to use an MLM model. The company operates in some regions of the US, where utilities have been deregulated, opening up the markets to smaller businesses. The company also operates in Japan. The company earned $1 billion in revenue for the first time in 2013 and most recently had $1.2 billion in 2016. Inc. has regularly named the company to its Inc. 5000 list, recognizing it as one of the fastest growing private companies. Oriflame is a Swedish beauty company with a presence in 60 countries. In 2016, the company had revenues of $1.4 billion. After several years of decline, 2016 was the first year it had seen growth in a while. Sales were up 3 percent. The company is experiencing an uptick in popularity in certain markets, even as its consultant list is shrinking. In 2016, the number of consultants fell by 7 percent to 3 million. Three of the brand’s biggest markets include Russia, China, and India. In 2015, Jeunesse celebrated $1 billion in sales for the first time, making it one of the fastest growing network marketing companies. By 2016, its revenue had grown to $1.41 billion, putting it squarely in the top 20 on the Global 100 list. The anti-aging skincare products company is active in more than 88 markets around the world. In 2014 (the most recent year information is available), the company had an average of more than 28,000 distributors. Distributors in the upper tiers earned an average of $1,681,110.20 in 2014. In 2016, Jeunesse landed in the 481st spot on the Inc. 500 list of Fastest Growing Private Companies. It was the only direct selling company to do so. Not all network marketing companies focus on tangible goods or wellness products. Primerica is a direct selling company that offers insurance and other financial products. The company had revenues of $1.52 billion in 2016, an increase of 11 percent. Since the company sells insurance and financial services, representatives that work with it are known as life insurance licensed representatives. At the end of 2016, the company had 116,827 representatives, 9 percent more than the previous year. In 2015, Primerica made it to Forbes’ list of the 50 Most Trustworthy Financial Companies in America. Melaleuca, a wellness-focused network marketing company, had revenue of $1.75 billion in 2016, an increase of 31 percent from the year before. The company operates in 18 countries and estimates that it has around 1.8 million customers. Melaleuca doesn’t consider itself an MLM, according to Forbes. It sees its distributors as customers and awards commissions when customers refer others to the company. Its formula must be working because the company isn’t the only one doing well financially. Its founder and CEO, Frank VanderSloot, has a net worth of around $1.9 billion, making him the wealthiest person in Idaho. Nu Skin got its start in Utah in the middle of the 1980s. An MLM that offers wellness products and anti-aging skincare, it had revenues of $2.2 billion in 2016. Although its revenue was down in 2016 compared to 2015, that was mainly due to fluctuations in the value of currency and the strength of the US dollar. While revenue dipped slightly, earnings per share increased to $2.55 from $2.25 in 2015. The company currently has a presence in five markets: Greater China, North Asia, South Asia, The Americas, and Europe/Middle East/Africa. China is one of its bigger markets, where it had 248,000 customers and 26,625 sales leaders in 2016. Surprised to see Tupperware on this list? Don’t be. With revenues of more than $2.2 billion in 2016, the company made it to the 10th spot on the Global 100. It’s also tied with Natura for the second highest market cap, at $3.5 billion, according to Business for Home. In the first quarter of 2017, sales were up by 6 percent for the company overall. A large part of that growth is due to Tupperware’s popularity in global markets. For example, sales are up by 42 percent in South America. The company is proving popular in China, where sales were up 31 percent. Globally, the brand had a sales force of more than 3 million people, an increase of 1 percent from 2015. Natura had revenues of $2.86 billion in 2016 and a market cap of $3.5 billion. Based in Brazil, the company was listed at number 75 on Forbes Most Innovative Companies list in both 2013 and 2014. The cosmetics company had consultants in seven countries in 2016: Brazil, France, Argentina, Peru, Chile, Colombia, and Mexico. It had 1,256,000 consultants in Brazil alone and 543,000 consultants in all the other countries, an increase of more than 7 percent from the year before. Infinitus markets and sells 89 health products under a variety of different labels. Chinese herbal and holistic medicine is at the heart of the company. In 2016, the company had revenues of $3.41 billion. The year before, it had inked a deal with Cambridge University in the UK. The five-year deal, worth 4 million pounds, will examine the activity of certain compounds at the cellular and molecular level. Along with its headquarters in China, Infinitus operates in Hong Kong, Malaysia, and Taiwan. In 2016, Mary Kay Cosmetics had revenues of $3.5 billion. The brand has 3.5 million distributors around the world. Since it is a multi-level marketing program, many of those distributors have recruited others and moved up in the ranks. About 39,000 women in the company are independent sales directors. Around 600 are Independent National Sales Directors, which is the top level a person can achieve. Mary Kay has consistently landed on many of Forbes’ lists of top companies and employers. At the end of 2015, it was number 341 on the list of best employers. It was also number 107 on the list of largest employers that same year. Vorwerk, a household goods company based in Germany, comes in at number four with 2016 revenues of $4.20 billion (or $3.1 billion Euros). Despite its billions in revenue, Vorwerk has a small distributor network. In 2016, 649,075 people worked as consultants with the brand, according to its Facebook page. According to the company’s annual report for 2016, the number of consultants who work with one of the brand’s companies has steadily increased in recent years. For example, in 2015, there were 625,496 consultants. Number three on the Global 100 is Herbalife, with $4.5 billion in revenue in 2016. The company also has a market capitalization of $6.44 billion, according to Business for Home, making it the direct selling company with the highest market cap. Market capitalization is the product of the value of a company’s outstanding shares multiplied by the cost of its shares. At the start of 2017, Herbalife reported that it had exceeded expectations for the first quarter. Net sales were more than $1 billion during the first part of the year. In 2016, Herbalife entered an agreement with the FTC to avoid being labeled as a pyramid scheme, according to Fortune. As part of the deal, the company had to change some its business practices. It remains to be seen whether those changes will negatively or positively affect the company overall. The next largest network marketing company is another oldie. Avon’s been around in some form or another since the 1800s. In 2016, it had revenues of $5.7 billion. Although that number is a decline of 7 percent from the previous year, it still landed the company in the number two spot on the Global 100 list. According to a company fact sheet, more than 6 million people sell Avon products in about 70 countries. CNBC reported that the number of “Avon Ladies” declined by 3 percent in the last quarter of 2016, but that the company has big plans for a turnaround. It hopes to start using technology, including social media, to reach new customers and to update its image. Amway, which got started in the 1950s, was one of the first network marketing companies. It was the company that introduced the concept of multi-level marketing to the world. Although the company has had its ups and downs over the years, including a 12 percent drop in sales in 2015, it still holds the title of the Biggest and top MLM company out there. Why? Well, even with the decline in sales, its revenues for 2015 were still $9.5 billion. In 2016, its sales continued to fall, to $8.8 billion. But it still took the number one spot on Direct Selling News’ Global 100 list. For 2017, the revenues once again took a bit of a dip to $8.6 billion, though that is still a tremendous amount more than the company in second place. With numbers like this, it’s no wonder it tops the list for 2019. Amway doesn’t just do big sales. It’s also got a huge distributor network. An exact figure isn’t available, but the company claims that it has millions of distributors. It also employees 19,000 people, landing it in the 29th spot on Forbes’ list of America’s Largest Private Companies. Although it’s got a massive presence in the US, that isn’t its only market. It’s active in 100 countries. In 2016, its top 10 markets were the US, China, Hong Kong, Russia, India, Malaysia, Taiwan, Thailand, South Korea, and Japan. DO YOU HAVE ENOUGH CUSTOMERS?